Planning, modeling of your surroundings, interpretation of sensory inputs up to and including your perception of reality, memory processing and storage and the basic drivers of your moods and emotions occur in many functional regions distributed around the brain, including the visual cortex at the rear, temporal cortex at the sides, parietal cortex behind the crown of your head and the limbic system deep inside the brain. The limbic system controls your basic moods and emotions, your fight/flight response and deeper long term memory encoding as well as control of basic bodily functions such as breathing and heartbeat. Our devices have been developed for research and development applications. We have maintained an uncompromising approach to the design and development of our mobile EEG systems and we believe that spatial resolution; detecting activity across the main cortices of the brain is crucial to obtaining high-quality data. The wealth of data we have accumulated and analyzed and our detection algorithms, we believe, are second to none. Our technology is backed and trusted by the scientific, academic, engineering and media communities and has been validated via scores of independent research papers. Video capture of our 3D Brain Visualizer application showing activity over the entire brain and across the four major frequencies Delta, Theta, Alpha and Beta, using our 5 channel mobile EEG headset the EMOTIV Insight. Note: this is not possible with single channel EEG systems limited to detections of only the frontal lobe. EMOTIV offers three different kinds of detection algorithms, all of them built on extensive scientific studies to develop accurate machine learning algorithms to classify and grade the intensity of different conditions. Performance Metrics – EMOTIV currently measures 6 different cognitive states in real time – Excitement (Arousal), Interest (Valence), Stress (Frustration), Engagement/Boredom, Attention (Focus) and Meditation (Relaxation). We continue to improve and refine our performance metrics algorithms as well as build new detections. These detections were developed based on rigorous experimental studies involving volunteers for each state, where subjects were taken through experiences to elicit different levels of the desired state. They were wired up with many additional biometric measures (heart rate, respiration, blood pressure, blood volume flow, skin impedance and eye tracking), observed and recorded by a trained psychologist and also self-reported. EMOTIV performance metrics have been validated in many independent peer-reviewed studies. Mental Commands – based on unique and highly efficient methods, EMOTIV has developed a system for users to train direct mental commands where the user trains the system to recognize thought patterns related to different desired outcomes, such as moving objects or making them disappear. The system can be trained to recognize a single command in less than 20 seconds. Facial Expressions – muscle artifacts which commonly get rejected in laboratory EEG studies are diverted and classified to map the activation in different muscle groups and eye movement events. Our universal detections can be fine tuned for each individual to indicate 12 different facial expressions or events. Individuals with partial paralysis or unusual musculature can custom-train the activations. These events can be used to animate an avatar, detect specific responses and they may be tasked to execute commands. Combined with the on-board motion sensor we can provide a hands-free brain-controlled mouse, adjust music volume or track skip depending in mood, and many other options. All this can be embedded into third party applications using our API platform Cortex. The accuracy of our technology has been validated by independent studies many times over. 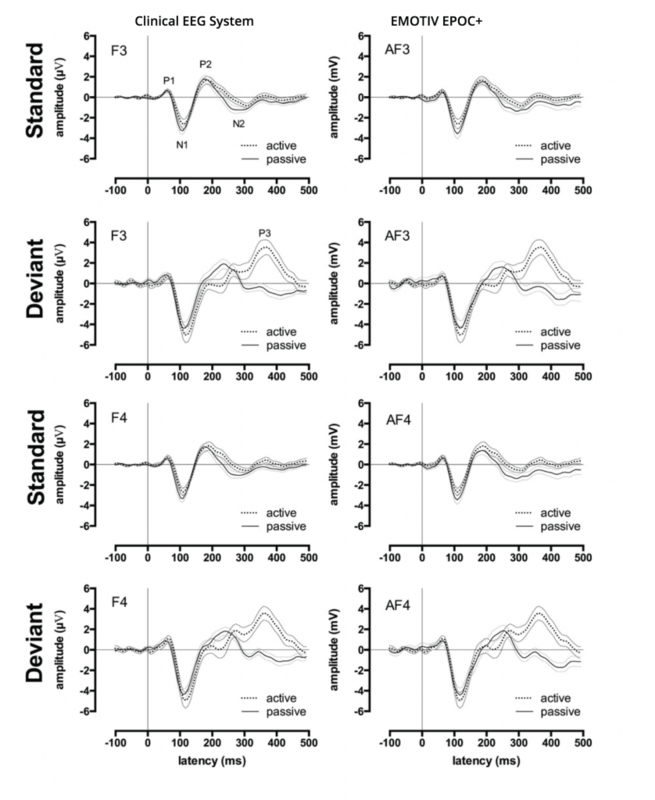 The graphs below show an independent comparison of a clinical grade system alongside the EMOTIV EPOC+ in an N100 auditory evoked potential study. The EMOTIV EPOC+, which costs $799 produced statistically comparable data to the clinical system, which costs $60,000. Click here to access the journal paper by Badcock et al., PeerJ, 2013.
visit our independent studies section.